Are Training Managers Focusing on the Right Things? Training managers are pivotal to training organization success; as I’ve detailed in a previous blog, preparing them for their role as a leader is key to ensuring an effective training organization. But what does the training manager role entail, and where should training managers focus their attention? While each of these responsibilities must be performed by a training manager, they are not equally important, and they vary in how often training manages perform them. 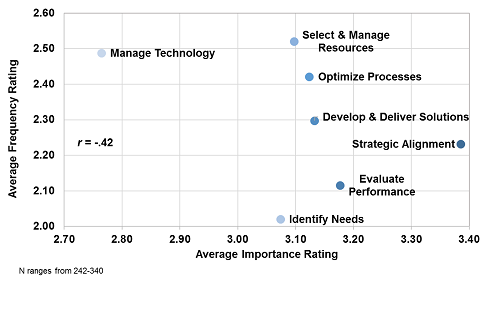 As part of Training Industry’s research to develop the Training Manager Competency Model™, subject matter experts (SMEs) rated the importance and frequency of each responsibility. The figure below plots the average of those ratings. As shown, the responsibilities where training managers spend the most time are not always the most important. For example, SMEs indicated that the average training manager spends time managing technology on an almost weekly basis, yet while managing technology was considered important, it fell short of being considered very important or critical for the role. At the other end, identifying needs was considered very important to the role but only necessary to perform on a monthly basis. And while strategic alignment was the most important responsibility for a training manager, it was also performed less frequently than most of the other responsibilities. What can we make of this information? Are training managers wasting their time focusing on less important tasks? The answer is less bleak than that. These data show us that some of the most important responsibilities are ones that training managers encounter less often. For example, the activities associated with strategic alignment, such as planning and meeting with business heads to discuss goals, are more often performed at regular intervals (e.g., once a quarter) rather than as part of a training manager’s daily routine. Yet, most would agree that strategic alignment is the most critical responsibility for a training manager. The activities involved in other responsibilities require more frequent oversight. For example, assigning projects to subordinates and selecting the appropriate resources for a given initiative are likely to be more frequently performed activities, making the “selecting and managing resources” responsibility a more frequently performed job function. However, many of these activities have a narrower impact on training organization performance and thus are considered less important for success in the role. The implication of this research is that training managers are receiving fewer opportunities to practice the most important activities for their role because the need to perform them is less frequent. And, as we know, with less practice comes fewer opportunities to improve and develop the skills needed for those responsibilities. Thus, these areas are fertile ground for development; not only are they critical for successful training manager performance, but it’s unlikely that training managers are able to rapidly learn and improve them on the job. Therefore, the takeaway is that the most important responsibilities (i.e., strategic alignment and evaluating performance) are the ones on which training managers should focus their more formal professional development efforts. Amy DuVernet is the director of certification programs at Training Industry, where she oversees all processes related to Training Industry’s continuing professional education programs, including development and evaluation. Prior to joining Training Industry, she worked as a business consultant designing and evaluating organizational interventions in a variety of industries. She holds a Ph.D. in industrial/organizational psychology from North Carolina State University and is a Certified Professional in Training Management.